Smark Hen-XT (2/1/19): TakeOver: Phoenix Fallout? NOT! - Smark Henry | The voice of Filipino wrestling fans | Philippine Wrestling Revolution, WWE, and more Smark Hen-XT (2/1/19): TakeOver: Phoenix Fallout? NOT! Smark Hen-XT (2/1/19): TakeOver: Phoenix Fallout? NOT! After a very eventful week of wrestling starting from TakeOver: Phoenix up to yesterday's NXT–that's five days of consecutive wrestling shows—I'm starting to feel a little delirious with so many things happening. We've already got reviews for TakeOver: Phoenix, PWR Live: New Year's Wrestle-ution, the Royal Rumble, this week's RAW, SmackDown Live, and NXT UK so you can absorb all this wrestling info. But before the week ends, I'm bringing you a very surprising review of this week's NXT episode. Why is it surprising, you ask? Well, for one, I felt that this episode felt like a mild waste in terms of following up on what happened on the previous PPV. Yes, as expected, there were highlights from the results of TakeOver, a few interviews here and there, but couldn't we have gotten any kind of in-ring segment with at least one of the competitors from the Royal Rumble weekend? 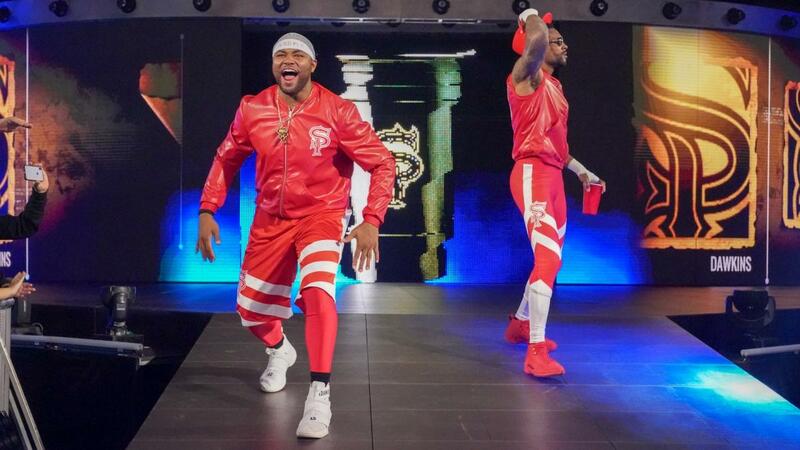 Again, I know, they're building the brand back up again after some interesting call-ups to the main roster, but when your main event is the Forgotten Sons versus the Street Profits (and this is not a knock on them, I'll tell you more later) it feels a little lost. In a smarky sense, it doesn't have too much heat on it to warrant the night's main event. I would have even preferred the Sky Pirates (yes, that's official now) as the night's main event—but only if Jessamyn Duke and Marina Shafir were better in-ring performers as well. This is not a rant. I know that NXT can produce great and diverse episodes since they've been constantly doing so over the past few years. Maybe the superstars who were part of TakeOver were given a break as a prize for putting on another grade-A show, hence, the non-appearances this week. It might be just me, but I feel that having only two matches—both tags—on a card where no main eventers (see: Velveteen Dream, Adam Cole or any of the champions) are present to further their storylines doesn't feel too enticing to watch. Anyway, as consolation, the Street Profits—especially Montez Ford—raised their stock. I've said time and time again that Ford is a talented performer and I can't wait to see more of his work in the tag team scene along with his eventual break into the singles ranks. Angelo Dawkins does well in a supporting role but I feel that the Profits are a launching pad for Ford's singles career. In the same sense, another point of interest is the women's tag team match. the Sky Pirates (that name sounds really good) as a team can be an interesting team to build—especially since WWE is heavily promoting women's tag team wrestling. Io Shirai and Kairi Sane will not get lost in the shuffle (with Belair being a key player now) and will eventually get an easy entry pass into the main roster should WWE decides to call them up. Apart from those positives, I feel a little disappointed that the episode lacked the usual oomph they have with such a weak match card. Here's to hoping next week is better as Johnny Gargano is advertised for an appearance at that show. I like Duke and Shafir's gimmick as a team. "Let's Play" and "Let's Fight" sound like interesting catchphrases which they can work on and integrate more into their personas. On the other hand, they need to work on a lot of in-ring skills. They really do look lost at times, what with their contemporaries Shayna Baszler and Ronda Rousey exhibiting some naturale in learning the craft. I might be in love with the Sky Pirates name and team-up. It feels so fun and fresh even if we've seen them tag previously. Jessamyn Duke is a big lady, that or they highlighted their size difference effectively. I hate Marina Shafir's ring gear because it felt very generic and lazy. Poppy's "X" is still a weird song. It's even weirder when set to highlights. The Street Profits' ring gear paid homage to Harlem Heat so I dig that, sucka! So is Angelo Dawkins the Stevie Ray of this team? Watch out for the Ford dive to the outside. Seriously, watch the match and look at this part. If you've ever wondered why I think so highly of the guy, then look for that clip and watch it. Remember my keyword: HIGH. Did you like this week's episode of NXT? What did you think of both tag team matches? What are you expecting for next week's episode? Share your comments and speculations at the comments section below. Miguel “The Migz” Llado is your supposed style icon and NXT reviewer at the Smark Henry offices. A lover of everything music, wrestling, videogames and food, he lives his life tweeting his mind off (@the_migz) and ‘gramming random food items and locations (@tha_migz) as he sets on his journey to completely do things spontaneously. You can also add him on PSN (MigzLlado) to show your WWE2K19 (or any PS4) skills. When not being a smark, he lives his life being (and trying to be) an awesome architect, musician extraordinaire and armchair fantasy booker.